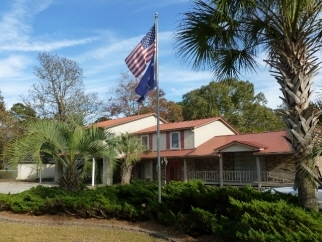 Unique property (2.2 acres) offers one-stop-shop for corporate headquarters location that offers four stand alone buildings: 1) A residential house converted to office with living quarters above office (3223SF). 2) Workshop building (5000SF)with indoor offices, shop area and restrooms, as well as outdoor covered area with lifts, and mechanical equipment. 3) Warehouse/garage (2000SF) with paved and covered parking, roll-up doors. Perfect place to hold inventory. 4) Storage shed (600 SF). Exterior Features Property is fenced, and wired for security. Other security features are included in property. Water tank on property for industrial needs. Perfect for business location what utilizes heavy equipment, and commercial vehicles. Easy access from I-26 (College Park exit). Zoned commercial. Also listed FOR LEASE. MLS# 1328706.